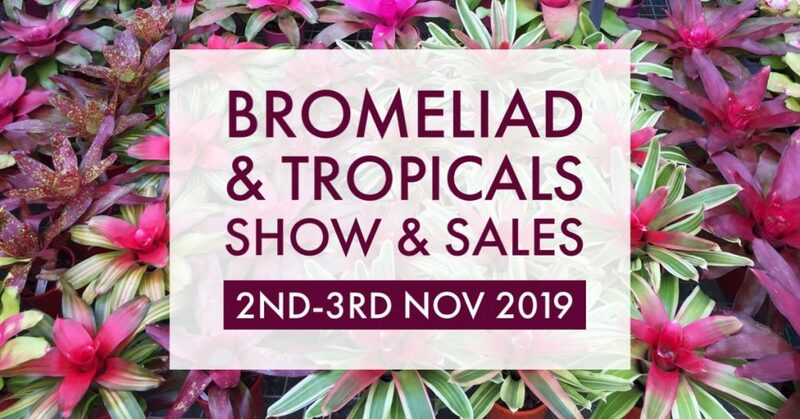 The Bromeliad Society of Queensland invites you to their 2019 Spring show – the Bromeliad & Tropicals Show & Sales. $4 per person. Free for children under 15 years old. Free entry for BSQ members. Become a BSQ member. For garden clubs/societies, discounts are available for large groups. Contact us for more information. There will be a variety of plants for sale from over twenty experienced growers including bromeliads, tropicals, indoor plants, orchids, hoyas, begonias, succulents and many more. From green thumbs to novice gardeners, you won’t leave empty handed. Kid-friendly. Plants will be refreshed throughout the event. Cash and EFTPOS accepted. For the serious collectors, there will be a Rare Plant Auction on the Saturday at 11am. If you cannot attend, online bids will be accepted on Facebook with the highest bidder being a phone bidder on auction day. There will be two prizes in the Monster Raffle with a total combined value of $500 if plants. Tickets can be purchased at the Show. Winners for the Monster Raffle will be drawn at 12 noon on Sunday 3rd November and will be contacted after the drawing of the prizes. Thanks to the growers for donating the plant prizes. Fill in your details at the show to go in the draw to win $100 worth of plants, it’s FREE to enter! The winner of the Lucky Door Prize will be drawn at 12 noon on Sunday 3rd November and will be contacted after the drawing of the prize. See these plants at their best at the displays and see who the winners are in the competition plants. Join us! Become a Bromeliad Society of Queensland member and you’ll receive a voucher. For only $45 for a single and $50 for a family, you will receive membership for the remainder of 2019 and all of 2020. You’ll also get a Welcome pack that includes the 50th Anniversary magazine. Growers and Society volunteers will be at the event to help you choose the right plants for your garden and answer all your questions. Come and say hello, we love talking about broms! There will also be books available for purchase. After filling a box or two full of plants, take a break. There will be plant minding facilities and refreshments will be available.